We understand the important role pets play in the lives of our clients – and our own – and because of this, we make every effort to become a partner in your pet’s health care. We understand the anxiety that comes with allowing a pet to undergo any surgical procedure, no matter how major or minor. As client education is a top priority of ours, we make sure your fears are addressed and your questions are answered prior to any procedure. That being said, our veterinarians have years of experience performing a wide range of surgical procedures. Some of the common soft tissue surgeries we handle are routine spays and neuters, declaws, abdominal surgery, bladder stone or mass removals, foreign body removal, intestinal surgery, liver biopsies, splenectomy, caesarean sections, cancerous tumor removal, and more. 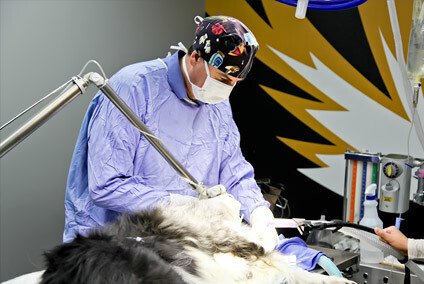 Surgical lasers have become a very important part of veterinary medicine. 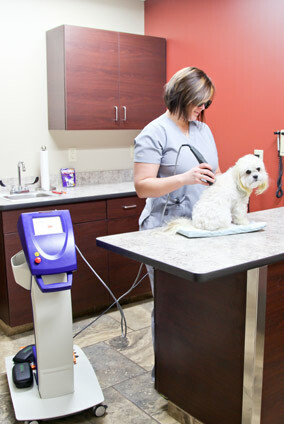 Eagle Animal Hospital and Pet Resort serving the Kansas City area is pleased to offer our clients and their pets the latest in surgical technology with the CO2 laser. In laser surgery, a highly focused laser beam efficiently vaporizes the affected living tissue. It simultaneously seals capillaries, small blood vessels, lymphatics and nerve endings. Laser surgery has significant benefits to both pets and surgeons. We perform many laser surgeries as well as laser declaws. Laser surgery improves many surgical procedures by simplifying them and reducing risks generally associated with surgery. The laser light seals capillaries and small blood vessels as it cuts and thereby dramatically reduces bleeding. This provides a much clearer and drier surgical site for the surgeon. A laser beam’s focal spot may be adjusted down to a small fraction of a millimeter or expanded for wider coverage. The laser power may also be set for rapid removal of large tissue amounts or adjusted to remove only one cell layer at a time. The hemostatic effect of the laser beam and the improved visibility of the surgical area reduces the surgery’s overall duration. Less Bleeding – As it makes an incision, the laser seals small blood vessels. The result is a significant reduction in bleeding which enables different surgical procedures to be utilized for optimal results for your pet. Less Pain – The CO2 laser beam seals nerve endings and lymphatics, which results in less edema and pain for your pet. Less pain also means less recovery time for your pet’s post-operative healing. Reduced Risk of Infection – One of the most unique features of the CO2 laser beam is that it efficiently kills bacteria in its path, producing a sterilizing effect. Quicker Recovery and Healing Time – Reduced risk of infection, less bleeding and pain and less swelling allow you pet to make a quick recovery after surgery. Before your pet undergoes any surgical procedure, a thorough veterinary examination takes place. This exam includes a pre-surgical blood screen, which, along with your pet’s anesthetic history, breed, preexisting conditions and age, will be used to determine a unique anesthesia protocol. These tests have the added benefit of establishing a baseline for the comparison of future blood tests, should your pet require any. For most surgical procedures, anesthesia is required. While under anesthesia, your pet is continuously monitored by both our staff and specialized anesthesia monitoring technology. Your pet’s blood pressure, heart rate, respiratory rate, body temperature, and oxygen level are all tracked during surgery. Just as with humans, pain has many negative effects on pets that go beyond physical discomfort. Pain after surgery can slow healing and worsen diseases like arthritis. And, because our companion friends don’t understand why they are experiencing pain, pain can cause behavioral issues and interfere with the bond between you and your pet. We customize pain management plans to meet the needs of each pet and his or her owner. We try to anticipate and prevent pain prior to a procedure, during it, and afterward to ensure the best possible results. It is our priority to ensure patients are both comfortable and pain free through the use of pre-anesthetics, local blocks, and post-operative medications. The exact protocol is tailored to each animal, and depends on a number of factors that are determined by the pre-surgery exam and during the procedure. Following surgery, pets recover in heated post-op recovery suites while their vitals and any signs of pain or discomfort are continuously monitored and addressed. The amount of time your pet will need to monitored after surgery varies. In some cases, animals will need to be monitored overnight; in others, they can be sent home the same day. When your pet is discharged, your veterinarian will provide you with information on proper home care after surgery. Often, your pet will be prescribed medication; in this case, we will explain how and when to administer it. We will also be available to answer questions after your pet arrives home. Laparoscopic surgery is a minimally invasive procedure of the belly allowing veterinarians to explore the abdomen and abdominal organs in dogs. Often referred to as ‘keyhole surgery,’ this type of surgical procedure is typically performed for specific reasons, such as a laparoscopic spay as a minimally invasive alternative to traditional spay procedures in female dogs. Your veterinarian may also recommend an exploratory laparoscopy to view the abdomen in order to detect diseases, such as stomach cancer and other abnormalities. Unlike traditional scalpel-based surgeries, a laparoscopy procedure involves making a small incision to allow a small tubular scope with a tiny camera (laparoscope) to enter the abdomen giving your pet surgeon a close-up view of the abdomen. For surgical procedures, another small incision can then be made to perform the actual surgery, with the scope giving your pet surgeon a clear view of the abdominal surgical site, allowing for quicker, more precise surgeries. Laparoscopy can be performed through a few small incisions, with reduced tissue damage, less pain, and ultimately, a quicker recovery time for your pet. Reducing pain and promoting healing is one of our medical team’s top priorities. To that end, we have invested in a class IV therapeutic laser, which we use on our patients following orthopedic surgery or an injury and to help manage a range of chronic and acute conditions. During each treatment, the energy from the laser increases circulation, drawing water, oxygen, and nutrients to the damaged area. This creates an optimal healing environment that reduces inflammation, swelling, muscle spasms, stiffness and pain. In addition, it can accelerate tissue repair and cell growth, improve circulation and nerve function, reduce scar tissue formation, and help the immune system fend off infection. Laser therapy causes no adverse effects on healthy cells. Pets typically do not need to be sedated for laser therapy treatments and the experience is usually pleasant and comforting. As the injured area returns to normal, function is restored and pain is relieved, allowing your pet to quickly return to his or her normal activities. 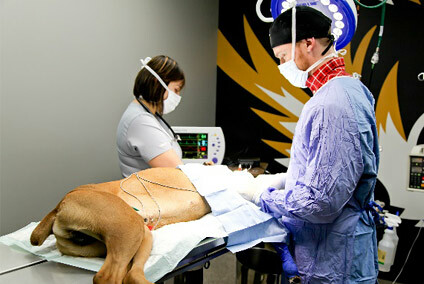 For questions following a pet’s return home or for more information about the surgical services Eagle Animal Hospital and Pet Resort offers, please give us a call at (816) 741–2345.